The Microtek ArtixScan M1 Pro is a large flatbed scanner that scans both reflective and transparent media at resolutions as high as 4800 dpi. The scanner ships with two software packages and two sets of four film holders. At $750, the M1 is inexpensive when compared to high-end professional scanners, but still more than most hobbyists would be willing to pay. The ArtixScan M1 Pro features an 8.5-by-14-inch reflective scanning bed for 48-bit digitizing of documents and printed photos. It connects to your Mac via USB 2.0. The M1 Pro can also scan transparencies, such as slides and film, in sizes up to 8.5 by 10 inches. Its four film holders accommodate 35mm slides, 35mm film, 6cm film (medium format), and 4-by-5-inch (medium format) film. Most dual-purpose scanners-those that can scan both transparent and reflective media-have you lay an object on a sheet of glass. The scanning sensor bar is positioned underneath that sheet of glass, and a second, fixed, light source used in transparency scans is usually resides in the lid behind another sheet of glass. The ArtixScan M1 Pro uses Microtek's patented E.D.I.T. (Emulsion Direct Imaging Technology), which puts the transparency light source well below the glass, creating enough space for a built-in sliding film-holder drawer between the transparency light source and the glass. This way, the light shining on the target doesn't need to pass through the glass, which can be marred by dust and smudges. These kinds of flaws can be problematic in reflective scans, but a bigger problem with transparencies. A 35mm slide, for example, scanned at 4800 dpi, can produce an 11-by-17-inch print at 385 dpi. Any dust or dirt on the glass or the slide could show up as big as a fist when blown up to that size. Also, when you're scanning at these high resolutions, attaining the correct focus can be difficult-a fraction of an inch can make a big difference. 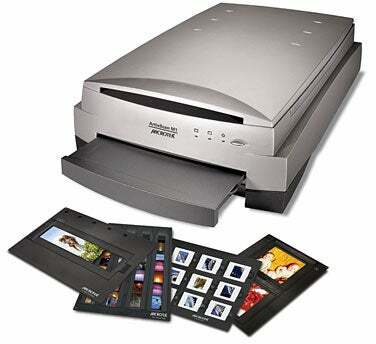 Some scanners ship with chips, or shims, that you can use to fine-tune the focus by lifting the slide or film up a bit. Microtek, however, has built in an autofocus feature that takes the guesswork out of achieving proper focus. The ArtixScan M1 Pro includes a full version of LaserSoft Imaging's SilverFast Ai Studio as well as Microtek's own ScanWizard Pro software, a PowerPC native application that uses Apple’s Rosetta translation software to run on Intel Macs. And while both of these applications work well in a stand-alone mode, Microtek’s ScanWizard Pro Photoshop plugin doesn’t work with CS3 running on Intel Macs. Microtek also sells a less-expensive version of this scanner, the ArtixScan M1 for $600. It features the identical scanner, but ships with SilverFast SE Plus (a lite version of SilverFast) and only one set of film holders. We used SilverFast Ai Studio in our testing. When we started putting the M1 Pro through its paces, the first thing we noticed was the disconcertingly loud clinking and clanking sounds the scanner makes when it's warming up. It turns out that these sounds were harmless, but they sounded alarming. I ran SilverFast's automatic IT8 calibration routine first, and then started to scan. Times weren't exactly fast, but the resulting files were of very good quality, with the scanner capturing a good amount of detail, even in shadows. This gave our printed scans more depth than some of the consumer scanners we've tested in the past. For many users, though, the differences are too subtle to warrant paying three times the normal amount for a scanner. So in effect, this scanner is really meant for slides and film, with the reflective scanning thrown in as a bonus. Moreover, the types of film that the M1 Pro can scan removes it from the consumer realm; most consumer scanners can scan only 35mm filmstrips and/or 35mm slides. I scanned quite a few different types of transparencies and found that the M1 Pro was able to reproduce accurate colors on dark slides that were problematic for consumer scanners. Dark areas held detail, even in deep shadows on the M1 Pro. Skin tones looked natural and healthy, and details in light areas were also maintained. The Microtek ArtixScan M1 Pro is a good choice for those looking for a desktop scanner capable of top-notch transparency scans as well as reflective scanning. With its support for many pro-level transparency types and two full-featured professional software packages, the ArtixScan M1 Pro is a step up, both in quality and in price, from consumer photo and document scanners. If you don't require two sets of film holders, or some of the high-end features of SilverFast Ai Studio, the standard version of the ArtixScan—the M1—costs $150 less. Intel Mac owners should know, however, that the Photoshop CS3 Plugin for ScanWizard Pro will work only with PowerPC-based Macs.